My niece and I did some flying a few days ago, soaring. 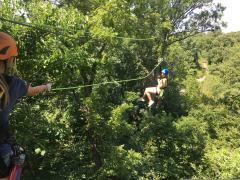 We did it on the steel cables at ZipKC, a great zipline course near Bonner Springs. 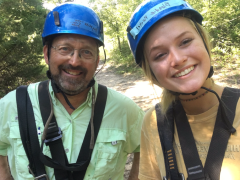 Zip-lining is an excellent adventure for those short on time, and of varying ages and activity levels. It’s thrilling, yet very safe, and does not require extreme physical fitness. Fourteen-year-old Natalie lives in Arkansas so we rarely get time together. I jumped at the chance to host her even two days this summer. We both wanted to cram as much as possible into that short time. Natalie wanted to walk the legendary shopping district on Massachusetts Street in Lawrence. She hit some cool boutiques. We had lunch where she used to eat with her late father, my brother, Randy. But I wanted something to create a lasting memory of our two days. Ziplining seemed perfect. I’d gone in Kauai and twice at Wildwood Outdoor Adventure Park near Manhattan. Natalie had zipped an Ozark course and was ready for more. Up front, I’m a klutzy person moderately afraid of heights. 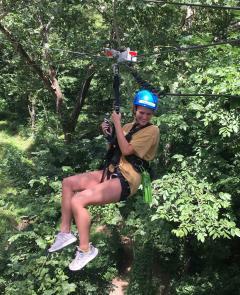 But I have no reservations about zip-lining. Serious injuries are very rare because the gear is solid and basically fool proof. We signed up for the maximum 9-line tour. After the 10 a.m. check-in, equipment fitting and safety talk we were in a bus and headed up the ridge. Rachel Santschi of KMBC 9 and a cameraman joined us to shoot a segment for an upcoming news cast. Rachel was a vivacious addition to the experience, as were guides Abreale and Mary. Both were in their early 20s, knowledgeable, personable and funny. The runs were great, and started with the slow bunny-zip of maybe 150 yards. Eventually we worked our way to some about a quarter-mile long. There were over a mile of lines, total. Some runs were at tree-top height and others above. A couple took us through cool tunnels the ZipKC crew had cut through the branches of the oaks and other trees. On most runs I went before Natalie so I could see the excitement on her face as she came in. At every landing she chattered with delight. We talked between runs, often overlooking some 50-mile views across the Kansas River Valley. The last run was more of a fall than a zip, as slack in the line took a while to catch us. The run was most easily done falling backwards off the platform, which was unsettling. I videoed Natalie’s fall, complete with shrieks and laughter. It seemed like we’d packed a week’s worth of fun into just three-hours. We were both excited, safe and carrying lifelong memories when we headed back to Lawrence.